Labour can stop rowing about whether we should abstain or vote against the Tory income tax cuts now, as the motion was put to the Commons last night. 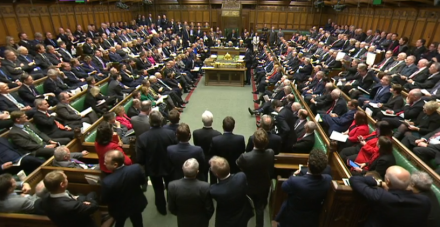 20 backbench MPs defied the party whip to vote against the threshold increases: Karen Buck, Yvette Cooper, Neil Coyle, Stella Creasy, Mike Gapes, Roger Godsiff, Kate Green, Margaret Hodge, Helen Jones, Liz Kendall, David Lammy, Pat McFadden, Alison McGovern, Ian Murray, Lisa Nandy, Jess Phillips, Lucy Powell, Emma Reynolds, Gareth Snell and Martin Whitfield. The first thing you’ll probably notice about the list of names: it is mostly made up of Corbynsceptics, including Jeremy Corbyn’s 2015 leadership contest opponents Cooper and Kendall. (Andy Burnham, his third rival, is of course no longer an MP but did kick off the internal tax cut row with a piece in The Times.) The second point many Labour activists have then made is that the vast majority did agree to abstain on the Tory welfare cuts in 2015. With the notable exception of David Lammy, Helen Jones and Roger Godsiff (plus Snell and Whitfield, who weren’t yet MPs), all those who rebelled yesterday did not do the same when a comparable (though, I hasten to add, not equivalent) situation arose under Harriet Harman’s interim leadership with Tory welfare legislation. These facts have made it easier to dismiss the rebellion as an anti-Corbyn move, and may have shifted how the less Corbynsceptic of these MPs are perceived. Today on LabourList, Labour Leave founder John Mills has penned a piece arguing that – distracted by the tax cut row – Labour has missed an opportunity to seriously attack the Tory budget. “The scale of the problem cannot be understated. The UK economy is perhaps at its worst point for thirty years,” and yet Philip Hammond ignored the fundamental issues facing our country. As Jonathan Reynolds suggested to LabourList readers on Wednesday, debate within our Labour family is crucial. But perhaps Mills has a point. Looking back at this week, the government was pleased with the initial reaction to the budget but things quickly turned sour, as the press found hidden horrors in the details. A particular low point came yesterday, which was partly overshadowed by the Labour rebellion. Tracey Crouch, minister for sports and civil society, resigned her post after the government decided to delay its promised reduction of the maximum stake on fixed-odds betting terminals (FOBTs). Due to take place by April 2019, the Tories amended the budget to instead have the change happen six months later. Tom Watson called Crouch’s decision to stand down “courageous and principled” and said new culture secretary Jeremy Wright had “prioritised corporate interests over victims”. Let’s hope her resignation makes a difference for those affected by FOBTs, and forces another U-turn.